There is a high chance a majority of the States within the United States of America could file for Chapter 9 bankruptcy. 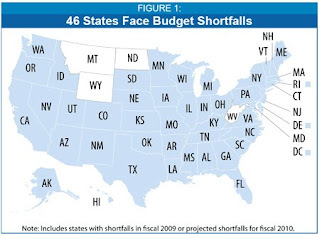 There are currently 46 states with high budget deficits, Arizona being one of them. In fact, Jan Brewer, the newly appointed Governor of Arizona has a major crisis on her hands, one that Arizona and national media isn’t covering. The alarming news is the State of Arizona has 90 to 120 days before they completely run out of money. After that, all bills and tax refunds owed to the citizens will go unpaid. Before Janet Napolitano left for her new Homeland secretary position, she had a stand-off with Arizona Treasurer Dean Martin. The AZ Treasurer forewarned Napolitano about Arizona’s financial crisis, but she refused to heed his words. With neighboring California on the verge of bankruptcy this year, many States will follow in their steps. Many States are already scurrying to cut unwanted costs, cut State-funded programs, raise taxes, not issue tax refunds to their citizens, and borrow money just to survive in 2009. Unfortunately, many banks — the same banks the Fed bailed out — are refusing to loan money to the States and their Treasury agencies. The article, State Budget Troubles Worsen, at the Center on Budget and Policy Priorities website is an excellent piece to read. It shows where each State currently stands in these challening economic times, and you see 46 of the 50 States are clearly in the financial red. It’s very possible you’ll see the end of the United States as we know it. If the Fed doesn’t bailout the States when their cash dries up and the banks don’t loan them money, then our States will be left in financial ruin. This would be a tragic and unprecedented event never experienced in the United States. No State has ever filed bankruptcy, but it could be coming to a State near you this year. We are on the brink of something far worse than the Great Depression. UPDATE: Check out the newly published article, Survivalism: How to Prepare for the Economic Collapse. There’s also a printable 4-page newsletter you can download and share with your friends, family, and co-workers. Take action and help spread the awareness of this life-threatening issue. Good update source Center on Budget and Policy. Excellent article for those who want the facts here.